What’s the difference between a RFP and a bid? In a RFP process, vendors and/or contractors submit ideas and suggestions for how they would tackle a project (within certain specifications, of course). Here, price isn’t the sole determining factor as to why a company gets hired, as it is with the bid process. This is a great option for dispatch center managers, because it enables them to take advantage of the vendors’ expertise and experience to design innovative solutions that meet the needs of even the most complicated comm center. On the other hand, a bid is a proposal on a center’s specific design. A bid process gives vendors very little room to be creative. Instead, the lowest price wins, as long as the company meets the requirements laid out by the client. While the bid process has upsides, managers need to realize that a low price doesn’t always equal the best value, especially when it comes to custom dispatch furniture. How do I come up with the specifications in my RFP? Most vendors’ furniture specifications tend to focus on how a product is built and not its performance. This is the wrong way to look at it. For example, steel construction sounds durable. However, if that’s one of your requirements, a company could essentially provide a product built with the same thin sheet metal that cans are made from! This would technically meet your specifications, but not your performance standards. You need to know how the product performs, and to find out, you need to ask for that information in your RFP. Think of what you need for the furniture to work for you. Can a 400-pound employee sit on it? Will it hold six monitors, with room for future growth? Will it keep the computers from overheating? These are all performance-based questions you should consider when writing your RFP specifications. This process is overwhelming! Where should I start? The Internet: How do you know what to put in your specifications so you’ll receive proposals that meet your needs? Start by looking online. 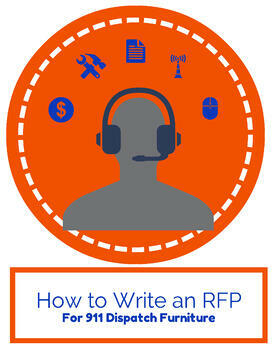 You can easily find examples of RFPs that other dispatch agencies have created. This is a good starting point, but resist the urge to copy and paste. The wants, needs and priorities of your dispatch center may be very different than that of other centers. 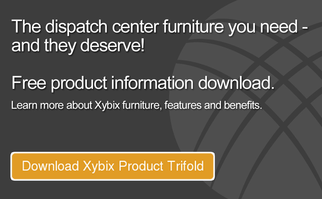 When it comes to dispatch furniture, there simply is no one-size-fits-all solution. The vendors: Many furniture vendors will offer a pre-canned RFP that you can send out, which makes the process easy for you. Just cut and paste a few words and you’re done. However, these pre-written RFPs are not the most effective means of getting what you need, because they’re not written with your agency in mind. They’ve been drafted for the sole purpose to help eliminate the competition. These canned RFPs often include tricky, senseless specifications that are unique to the company’s products and don’t make any difference for your center. Not to mention that pre-made product specifications can open you up to potential legal issues and slow down your project. If you use a potential vendor’s RFP, be prepared to answer many questions from other companies, such as: “Do you know what the minimum yield of 27 ksi and modulus of elasticity of 29 X 10 psi" is and how does it help you? We’re guessing you don’t, nor should you! Moral of the story: for the best results, write your own RFP. Your neighbors: Being a government agency has its advantages. Ask neighboring dispatch centers if you can look at the RFP they used. Ask them how the process worked. Find out what their specifications were, and if they were effective. You’ve probably already done this with many other products for your comm center. Why stop now? Now that I’ve done the research, what are some tips on writing a clean RFP? KISS: Keep it Simple Stupid! You can write a great spec by using plain English to ask for what you want. For example: “Computer cabinets must hold three computers, have two fans, and doors that hide the computers.” This works just fine. The less complicated the instructions, the better proposals you’ll get. Equipment Lists: Do not slack here! A strong, accurate equipment list is crucial. If you miss something, there is a good chance that you won’t have everything you need when the furniture arrives. This is a disaster for both the comm center and the furniture company. Take your time and think it out. Accurate drawings of the room: It is impossible for a furniture company to give you an accurate bid without being able to visualize how their furniture designs will fit in your room. Not providing this spells disaster. Verify! : Ronald Reagan once said, “Trust but verify.” This is what you must do to every vendor that sends a proposal. Just because they checked all the boxes on your list doesn’t mean they can actually meet your specifications. Some companies know all too well that by the time you discover that a product doesn’t meet the specifications, it’s too late. You’re mid-install and can’t return the furniture. Ask the vendors questions, have them send pictures, talk to their current customers, etc. If they want your business, they’ll provide you with the answers you’re looking for. Independent testing and certification: There are ways for you to know that a company creates quality products that are built to last. Check if the vendors you’re considering are certified by the Business and Institutional Manufacturers Association (BIFMA), a group of furniture manufacturers that has created performance-based testing for office and institutional furniture. BIFMA has three categories that specifically apply to dispatch furniture. Make sure the company you’re considering has passed these tests and can prove it. Additionally, determine if a vendor follows ANSI – HFES 100-2007, the national ergonomic standard for engineering computer workstations. This sets minimum and maximum requirements that all dispatch furniture vendors must meet so they can provide equipment that benefits employees. Verifying these independent testing and certification standards allows you to “CYA” down the road if a product doesn’t work out. It’s not easy to put together a legible, comprehensive RFP that will effectively outline what your business needs. But if you do your research, follow these tips, and ask a lot of questions, you’ll be able to get it right.